VATICAN CITY (CNS) — Pope Francis’ decree to beatify two Colombian martyrs from two troubled eras in the South American country’s history underscores his call for courageous witness amid violence and persecution. “What does the church need today?” the pope asked earlier this year at an evening prayer service honoring Christians killed under Nazism, communism, dictatorships and terrorism. “Martyrs and witnesses, those everyday saints, those saints of an ordinary life lived with coherence. But it also needs those who have the courage to accept the grace of being witnesses to the end, to the point of death,” he said. The lives of Bishop Jesus Emilio Jaramillo Monsalve of Arauca, who was murdered by Colombian Marxist guerrillas in 1989, and Father Pedro Maria Ramirez, who was killed at the start of the Colombian civil war in 1948, seemingly fit the pope’s description. Their beatification, which will take place during the pope’s visit to Colombia Sept. 6-10, comes at a time when the nation focuses on reconciliation after decades of conflict that saw the deaths of more than 200,000 people. Bishop Jaramillo was among the hundreds of thousands of innocent lives caught in the crossfire of Colombia’s 52-year civil war between government forces and guerrilla groups. Born in Santo Domingo, Colombia, in 1916, he entered the Xaverian Missionaries and was ordained Sept. 1, 1940. In 1984, St. John Paul II appointed him as the first bishop of the Diocese of Arauca. It was there where he spoke out not only against the atrocities committed by the National Liberation Army — known by the Spanish acronym ELN — but also denounced the climate of fear among the people he served. It was his words of encouragement against violence that prompted the ELN to order his kidnapping Oct. 2, 1989, while visiting local parishes. According to his biography, one of his parish priests, Father Jose Munoz Pareja, refused to leave his side. Despite assurances from the captors that no harm would come to the bishop, Father Munoz found his body the next day, lying on his back in the form of a cross. Bishop Jaramillo was shot twice in the head with an assault rifle. Forty years before Bishop Jaramillo’s martyrdom, a local priest in Armero — located roughly 200 miles south of Medellin — quickly penned his last will and testament. “I want to die for Christ and the faith,” he wrote, before an angry mob dragged him outside, lynched him and butchered his body with machetes. The martyrdom of Father Pedro Maria Ramirez came during another difficult period in Colombia’s history, when escalating tensions between liberals and conservatives boiled over following the death of Liberal presidential candidate Jorge Eliecer Gaitan. Gaitan’s death sparked a 10-year civil war known in Colombia as “La Violencia” (“The Violence”). It also gave rise to the left-leaning guerrilla groups that battled against the government in the 20th century. 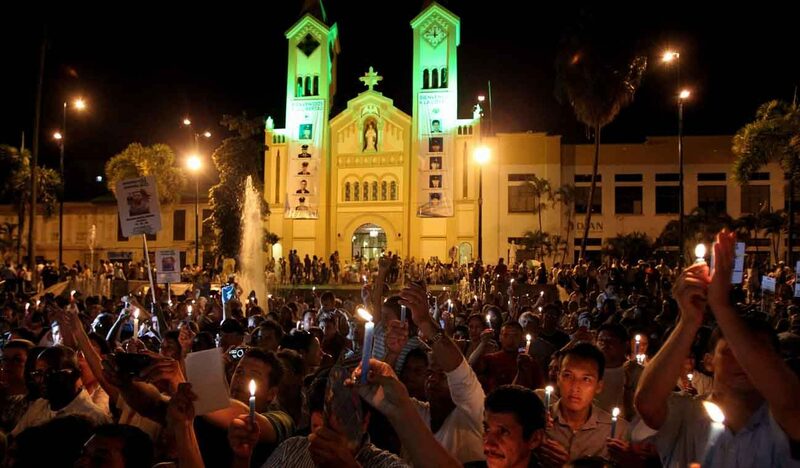 Violent Liberal Party members in Armero revolted against Gaitan’s assassination and accused the Catholic Church of colluding with the Conservative Party due to the church’s apparent support and continued calls for nonviolence. On April 9, 1948, an angry mob attempted to arrest Father Ramirez and destroyed church property as well as a nearby convent. He was able to escape with the help of a nun, Sister Miguelina. However, despite appeals from parishioners and family members to leave the town, Father Ramirez refused and, the following day, continued his work by celebrating Mass, hearing a sick patient’s confession at a hospital and visiting prisoners. Upon his return, he gave the last consecrated hosts remaining in the tabernacle to the nuns, keeping one for himself. He then remained in the convent to write his last will and testament as the sound of the returning mob could be heard approaching. After thanking his bishop for allowing him to become a “priest of God,” Father Ramirez wrote words of encouragement to his family and his flock. “To my family, I say that I will be the first in the example that they must follow: to die for Christ. To all, with special affection, I will look after you from heaven,” he wrote. Bishop Fabio Duque of Garzon, the diocese where Father Ramirez served, said that, following his violent death, the mob decapitated him and “played with his body and his head” before his remains were rescued from further desecration. “The ones who rescued his body were the prostitutes, who ferociously guarded the cemetery so that (the mob) wouldn’t continue mistreating it,” Bishop Duque said in a July 8 interview with the Colombian newspaper El Tiempo. Even after his death April 10, 1948, Father Ramirez continued to be slandered and accused of calling for violence against Liberal Party members. On June 8, Gloria Gaitan, daughter of Jorge Eliecer Gaitan, wrote a letter to Archbishop Ettore Balestrero, apostolic nuncio to Colombia, asking the pope reconsider his decision. Gloria Gaitan claimed many priests during that time, including Father Ramirez, used the pulpit to “denigrate and slanderously vilify” her father’s candidacy, leading to his death. “(Father Ramirez) was unfortunately lynched for having denied Christ’s message,” she wrote. However, Vicente Silva Vargas, a journalist and author of an upcoming biography on Father Ramirez, said that, even after death, the priest was blamed for various occurrences in a smear campaign to justify his murder. Most notably, a phrase erroneously attributed to him was believed to be a curse that caused the explosion of a nearby volcano in 1985 that claimed the lives of more than 25,000 people. Silva told El Tiempo that the phrase, “In Armero, no stone will remain overturned,” was said by the archbishop of Ibague, Colombia, a neighboring diocese; the archbishop shared the slain priest’s name: Pedro Maria. Bishop Duque said that, contrary to the false accusations, Father Ramirez remained an example of holiness and heroic virtue until his final breath. “The clearest expression of his holiness is that, at the moment of his death, he forgave those who killed him,” he said.